The audience at today’s Central Philadelphia Development Corporation quarterly meeting at the Union League got an update on how that circle is being formed from the three developers responsible for getting the thing rolling: Mark Merlini, partner at Brickstone Realty; Daniel Killinger, managing director of National Real Estate Development, and Joseph F. Coradino, chief executive officer at PREIT. They also got a rundown on the progress each is making in finding tenants for their developments. More tenants and hints of things to come for the Fashion District Coradino had the biggest news. Besides AMC and a previously announced 38,000-square-foot superstore for H&M, he announced that PREIT and its development partner Macerich had also landed several other retail tenants for what is now being called Fashion District Philadelphia, a total reworking of the old Gallery mall. Jeans icon Levi’s, shoe retailer Skechers, outerwear outfitter Columbia Sportswear and women’s boutique Francesca’s will all be coming to the revamped shopping center. “All of these are first-in-Center-City stores,” he said. Coradino also dropped hints about the dining destinations to come. One of the destinations, he said, will be a collection of restaurants called “Market Eats” that will cater to shoppers, visitors, and commuters headed to and from Jefferson Station on the center’s lower level. One of the eateries will be housed in an Airstream trailer while another will operate from a restored railroad car. “There will be best-of-market, all-natural pizza,” handmade on the premises, he said. “There will be gourmet burgers and a sports bar that will have take-away cocktails so those commutes home will never be the same again.” All of the restaurants will offer table or counter service on the side facing the stores and grab-and-go options on the side facing the Regional Rail hub. What “Market Eats” won’t be, he said, is a typical mall food court, no more than the Fashion District will be a typical mall. 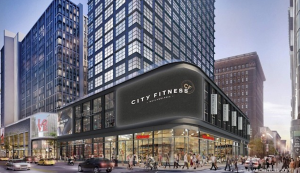 He also said that a European food retailer would be opening its first US location and that leases were in the works with unidentified apparel and cosmetics retailers who will also open their first Center City stores. Finally, one of the area’s anchor institutions, Wills Eye Hospital, will open a retail eyewear store in the Fashion District with Wills Eye ophthalmologists offering diagnostic services. Read the full article at Phillymag.com.